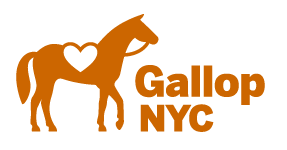 Volunteering with GallopNYC is one of the most rewarding, exciting, and fun activities in NYC! Volunteers are able to experience the personal satisfaction of helping children and adults with developmental, emotional, social, and physical challenges, all while working with and being around horses, one of nature’s most sympathetic and empathetic animals. Ready to start? Create your account here! After you create your account, a member of our team will be in touch by email and will share with you next steps about completing your orientation. Welcome aboard!